Wind Power: Cool Breeze or Hot Sirocco? Jamie Bull brought to my attention a paper saying that land based wind turbines are likely to create a small degree of earth surface warming. Jamie was concerned that there might not be a net surface cooling, even once the effects of reduced greenhouse gas emissions were taken into account. He did some calculations, and showed that the net effect of wind power on surface temperatures was still strongly negative. He need not have worried. An understanding of the mechanism of this surface heating, and the conservation of energy make it clear that the surface heating effect of wind is smaller than the surface heating effect of thermal electricity generation such as coal, gas, nuclear, and Concentrating Solar Power (CSP) on a per kWh basis. Conservation of energy tells us that all the energy in wind is eventually dissipated by friction, creating heat. 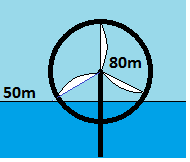 The effect of wind turbines is to take some of this energy that might have become heat in the atmosphere, and create electricity, which will eventually become heat on the earth’s surface, and some will become heat in the turbine itself. The net heat added to the Earth by wind turbines is zero: heat that would have been created in the atmosphere is now created on the surface instead, and the net effect is zero. Now consider thermal electricity generation. When a fossil fuel is burned, or when a nuclear power plant or CSP plant makes steam, heat is either created from a fuel or captured from the sun, reducing the amount that would reflect back into space. All this heat is dissipated at some point near the earth’s surface, creating more surface warming than wind power, and also creating net warming where wind power creates none. The direct surface heating effect from wind is likely to be only a fraction of the direct surface heating effect of thermal electricity, even before the effects of greenhouse gasses are accounted for. Solar PV and Solar CSP capture heat from the sun that might otherwise reflected into the atmosphere, so more precise calculations are probably needed to determine if their net effect is negative before the effects of greenhouse gasses, but wind is clearly cool by any thermometer. Is There a Tradeoff Between Economics and the Environment? California’s RETI process lends insight into the near-term prospects of Solar, Wind, Geothermal, and Biomass. In September, California’s Renewable Energy Transmission Initiative (RETI) released their Phase 2A report, which outlined potential transmission corridors to collect renewable energy from Competitive Renewable Energy Zones (CREZ) that had been identified in previous phases. As part of Phase 2A, they also screened each CREZ for environmental impact, and the potential difficulty of obtaining land for renewable energy development. I previously looked at the results from Phase 1A and gained some insight into the cost of renewable energy technologies. However, what renewable energy projects actually get built has to do with a lot more than just economics. If it raises too many environmental concerns, such as infringing on endangered Mojave Ground Squirrel habitat, it isn’t going to get built. Drawing on the spreadsheet "Supplemental Materials, CREZ Data" I put together the following charts, graphing the economics of each type of renewable energy in each CREZ against the expected environmental impact of that CREZ. Each circle represents one type of renewable energy at one of 35 CREZs. Concentric circles in different colors appear where a single CREZ offers multiple types of renewable energy development. The only difference between the two graphs is the size of the circles. In the first graph, circle sizes represent the potential annual energy production (GWh/yr) of a CREZ, while circle sizes in the second shows power rating (MW.) Geothermal and Biomass resources are relatively larger in the first graph because these are typically baseload technologies generating electricity near peak capacity all the time, while solar and wind are variable. The cluster of circles in the middle right represent resources outside California: they were not rated for environmental concerns, so I assigned them an arbitrary value in the middle of the range in order to display them on the charts. Considering these four major renewable energy technologies, as they might be deployed in California, there is no real tradeoff between economics and the environment. The best economics coincide with the least environmental impact. If we were to include energy efficiency in the analysis, the trend would be even more pronounced: energy efficiency has the best economic profile of all, yet avoids the use of energy and hence does less harm to the environment. The exception here is biomass. The small green dots don’t show a pronounced trend in any direction, meaning that there may be some tradeoff for biomass. Such a tradeoff would not be surprising, because harvesting plant matter on a large scale is bound to have significant ecosystem impacts. Note that Biomass here does not include such technologies as waste to energy, which can be environmentally benign, or even an improvement compared to land filling. In this study, the biomass in remote regions that do not yet have transmission, since lack of sufficient transmission was one of the requirements to be a CREZ. With clean energy, it may actually be possible to do well while doing good. I recommended the Algonquin Power Income Fund as a renewable energy income investment back in January, and as part of my ten clean energy picks for 2009. Since then, both the stock and the ten picks have been doing well in comparison to the market, but Algonquin has entered into a couple deals, while I look into in a recent update on the Algonquin Power Income Fund.